Fall is always a busy time at the studio. Pet portraits, Weddings, High Scool Seniors and those family portraits that show all the colors of what a Blue Ridge Fall has to offer. So many of our Fall family portraits are done in anticipation of the the holiday season. Prints and canvases from these sessions are often use a christmas gifts, cards and, of course, for display in the home. Wall Portraits with all the fall colors and the entire family is a piece of art that just can not be duplicated. This October we have decided to participate in Family Portrait Month (click here for more about FPM) with our national association the Professional Photographers of America, and Operation Smile. With every Family Session we book in October, a portion of the session fee will go to Operation Smile and we will also include 24 of our customed designed Christmas Cards. 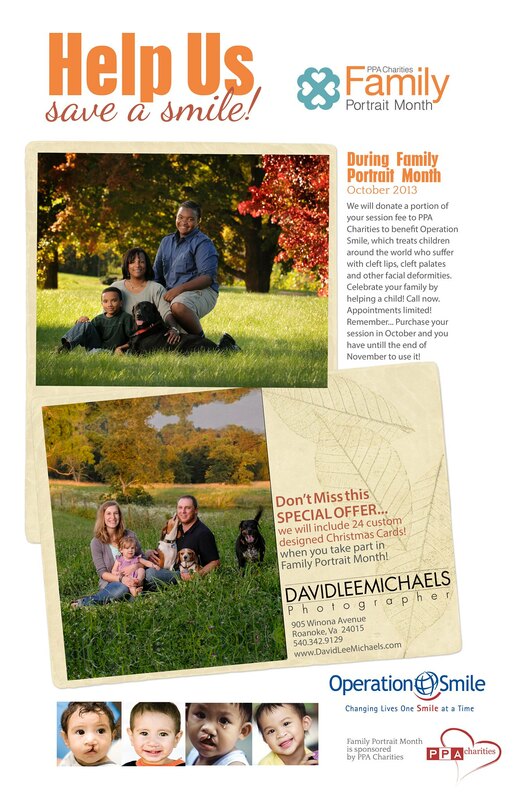 Also, when you purchase your Family Portrait Session in October, you have untill November 30th, 2013 to use it! Call us at 540.342.9129 to purchase a session or for more information.